Todays post will be quite short but template below is definitely worth to check. It is another simple business resume template created in Microsoft Word format. Advantage in working with this template is that you can also split section in multi-columns which can be used for experience or e.g. training or achievements part of resume. Business resume template is divided into areas like “Career Objectives”, “Experience”, “Education”, “Skills” … and at the end of the template is place for your contact details. Although it is designed as single page template, it can hold a huge amount of information and it is up to you, how the information will be split into areas. 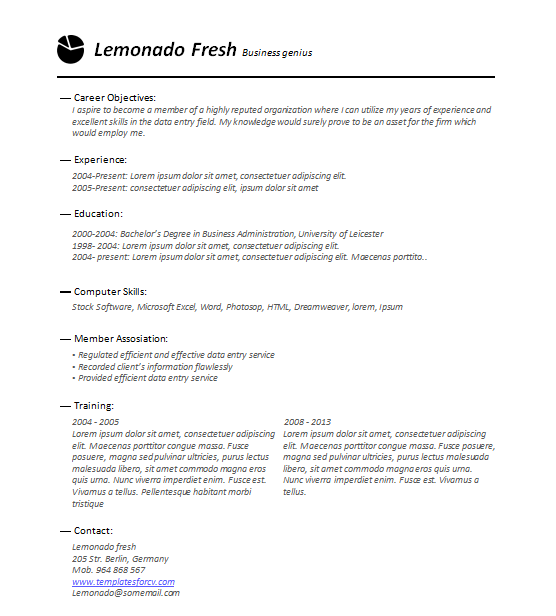 So what do you think about this business resume template? Do you prefer Word format or you like more resume templates created in Photoshop or another graphical tool? Please leave us feedback on our social network channels. It is by us highly appreciated because it helps us to move forward. Thank you for your time and have a nice rest of the day.